SAHIL export quality sheet fed offset printing machines are widely appreciated & recognized for their swift & high quality printing, low maintenance, & economy all over the globe. Sheet fed offset presses for flexible production of high-quality printing products. As an answer to the worldwide demand for a reliable, uncomplicated, and profitable sheet-fed offset press, SAHIL also offers the well-proven single color offset press which gives high quality production compare to imported, used or rebuilt machines. New advantage of the latest Export Model, the new SAHIL automatic offset machines are contributing to improved printing quality, easier operation, and shorter make-ready-time. The single color sheet fed offset press is solid, simple design & extremely easy to operate. A compact & operator-friendly press with easy access to controls, SAHIL solna type single color offset machine requires low power consumption & little floor space. A well designed inking system with 20-Roller arrangement ensures smooth, even ink flow to the form rollers for extraordinarily high quality reproduction. Sturdy construction, bearer contact, improved pull side lay, & three large form rollers of varying diameters for superior ink distribution ensure high quality dot sharpness & top printing quality. All cylinders are cast in one piece and are of treated alloy cast iron and hard chrome plated. Stream Feeder gives smoothest control of each sheet as it approaches the feed board. Double sheet detector & no sheet detector are provided on feed board for safety. The printing equipment is considered to be suitable for multi color printing on all types of paper stock including map litho, chrome art paper, manifold & heavy duplex board. Economic priced sheet offset machine, Engineered in India to meet the International Standards. 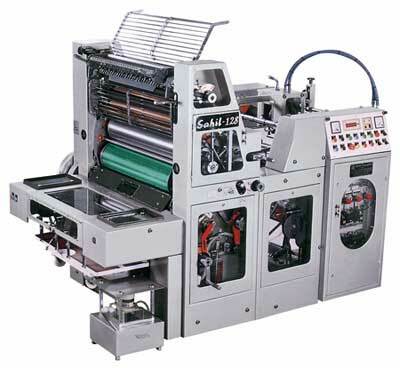 Now, the name SAHIL is synonymous to world most popular SOLNA type offset machines in the Indian printing industry. Note : Printing speed depends upon kind, condition and thickness of stock, type of inks used, desired printing quality and other operating conditions. Illustration/Specifications are not binding and are subject to change without notice due to our continuous R & D effort for Improvements / Modifications.